The premise of In Country—a documentary about a group of men who engage in reenactments of the Vietnam War—suggests it’s going to be another The Act Of Killing or, perhaps if it plays more as comedy, reminiscent of that play Max Fischer stages at the end of Rushmore. It turns out to be something else: an exploration of the memories and impulses that tug at the souls of U.S. soldiers and motivate them to go, again and again, to the battlefield. Co-directors Mike Attie and Meghan O’Hara purposefully and thought-provokingly blur the line between real and fake combat throughout In Country, right from the beginning. The film’s first five minutes focus on Army men dressed in uniform and camo helmets, plodding through tall grass, AK47s cocked as they come upon what appears to be an abandoned Viet Cong camp. One soldier with the words “Ramble On” scrawled across the front of his helmet speaks quietly to camera about how he’s on his second tour and realizes there’s “no end in sight”—at which point, a clearly contemporary-looking red truck drives by his hiding spot in “enemy territory.” It turns out the end is not in sight because it happened almost 40 years ago. All those men fighting and sweating their way through the bush, possibly near the Ho Chi Minh Trail, are actually members of troop Delta 2/5(R), a bunch of guys who spend one weekend each year immersing themselves in the woods of Oregon, volunteering to go to a surprisingly authentic “Vietnam,” complete with rifles, tents, and the precise type of insect repellant used back in ’67 strapped to their helmets. Every participant is drawn to this exercise for different, but equally fascinating, reasons. Some—like Joel Kinney, that “Ramble On” soldier who happens to be an avid collector of Vietnam War memorabilia—are fascinated by the time period and the rush of testosterone and fear that comes from playing war. Others are veterans of the more recent war in Iraq who can’t tear themselves away from battle, even when the battle involves casualties who are only play-acting at having perished. And then there are the guys—including U.S. Army vet Hayden “Bummy” Baumgartner and Vinh Nguyen, who served in the South Vietnamese Army, fighting on the same side as the Americans—who actually lived through the Vietnam War but still feel compelled to return. 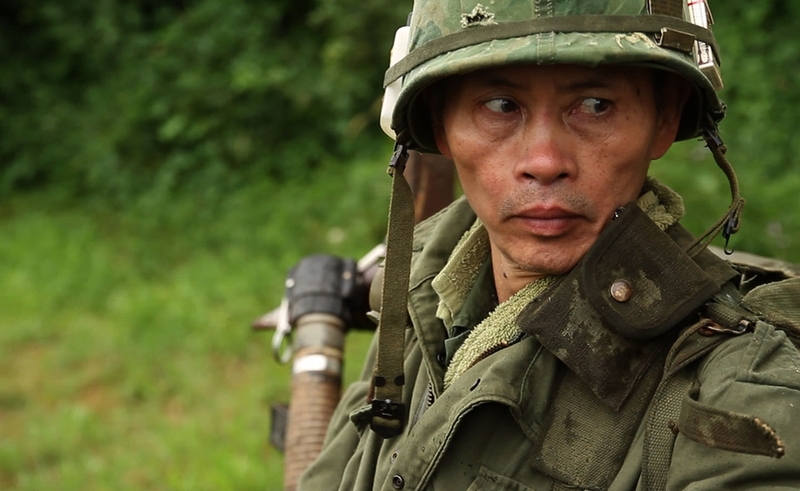 When an off-camera interviewer, presumably O’Hara, asks Nguyen why he wants to revisit memories that must be bad, he responds, “I don’t know exactly why you said bad memories … I am still whole now, still stronger, when I am with the South Vietnam Army.” Later during the reenactment, Nguyen wistfully describes how the sound of raindrops falling on his poncho tent took him so fully back to his years in Vietnam that he “burst out crying.” For every frightened kid who dodged the draft back then, there are men like these, still happily signing up to serve even when the draft and the war don’t exist anymore. These guys are so fascinating, in fact, that it feels like In Country could and should have gone longer than 80 minutes so that the movie could delve more deeply into their psyches and provide more context behind how these reenactments were born. This is the rare documentary that screams out for an extended cut, or perhaps to be adapted into an HBO series that’s sort of a meta-Band of Brothers. As it stands, Attie and O’Hara do a wonderfully restrained, effective job of portraying the never-ending repetitive loop that is military life. In the midst of all the strategizing and fake firefights that go on during this Full Metal Jacket version of a murder mystery weekend, the co-directors continually mix in clips from the real Vietnam conflict as well as personal videos shot in Iraq and Afghanistan by re-enactors who recently served there. Increasingly, the footage bleeds together so seamlessly that it creates a fog of war—both actual and pretend—that searingly reinforces In Country’s point: that our history, in Vietnam and elsewhere, is forever repeating itself.